Meeting Point: Outside of the ConBody building, at 121 Ludlow Street, Floor 2. To get there by subway, take the J, Z, F or M train to Delancey Essex Street stop. Tours occur daily at 10 am. Please email marnie@runstreet.com if you’d like to schedule a tour at another time. We do our best to accommodate your travel itinerary. The Lower East Side, filled with colorful murals and world-famous street art, is a testament to the vibrant neighborhood's roots as a music and art mecca. We will see dozens of incredible NYC street art pieces by artists from around the world on this tour. Some artists who have painted the colorful neighborhood include Tristan Eaton, Shephard Fairey, Claw Money, and Banksy. 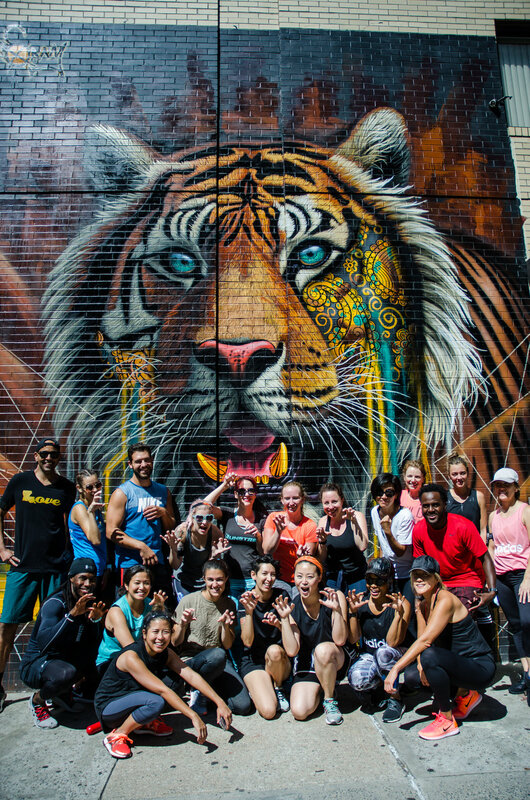 The Lower East Side running tour will also highlight the history of an area that served as the city's melting pot of cultures and workers for hundreds of years. We will pass historic landmarks such as the Tenement Museum, highlighting the history of factory workers who built this city. The Lower East Side has long served as an entry point to immigrants from Europe, Asia and the Caribbean, which we will see highlighted in a memorial walkway. We will also pass famous landmarks such as the legendary Katz's Deli.